Grace and Frankie don’t spend a lot of time together in “The Negotiation,” but the duo isn’t as sorely missed as I would have thought. The episode instead gives birth to a new partnership: Frankie and Brianna. Lily Tomlin and June Diane Raphael give the most consistently hilarious comedic performances episode-to-episode, so any subplot that unites these comedy forces is one that’s destined for greatness. The titular negotiation, indeed, does not disappoint. Brianna informs Frankie that Say Grace wants to sell her yam lube—a development that builds on some of the story seeds planted last season. Frankie informs Brianna she wants $9 million for the idea. Frankie holds pretty steadfastly to that insane number, but mostly she just wants to be taken seriously and to maintain creative control over the product she birthed. Their business meeting takes up a lot of the episode, but every single second is worth it. Wanting to seem like a real, true businesswoman, Frankie overcompensates with the professionalism, bringing along Bud as her legal counsel and introducing him by his full name to Brianna. “Yes, I’m familiar with your son, who I grew up with,” Brianna says wryly. Raphael and Tomlin are so great up against one another that they can bring humor to just the simplest of setups, like when Frankie keeps using the Vitamix when Brianna tries to speak or the amazing feat of physical comedy that comes from Frankie and Brianna insisting that the other sit first at their meeting. 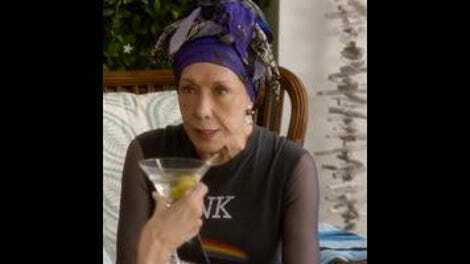 Even though they aren’t caught up in the same plot this episode, the scenes between Grace and Frankie still stand out as really strong emotional beats. Frankie helps Grace realize it’s okay that she isn’t the nurturing, down-in-the-mud grandmother that Grandma Jean is, which leads to Grace figuring out how to connect with her grandchildren in her own way. But I especially love when Grace and Frankie gab about Frankie’s kiss with Jacob. Grace is genuinely invested in the yam man developments, and their little gossip session really underscores their friendship, which is consistently the most compelling relationship on the show. At first, I thought Jojo the gay nurse merely signaled another meandering and lifeless subplot for Robert and Sol, who didn’t have particularly urgent storylines in “The Vitamix.” The Jojo stuff is pretty fluffy, but it ends up going in a slightly different direction than I expected. I thought he was merely around to provide some unnecessary conflict between Robert and Sol. Sol bristles at Jojo’s presence, and it looks like jealousy at first. But really, Sol’s discomfort comes from the fact that he doesn’t think he and Robert are the “kind of gay” Jojo is. Of course, his supposition is extremely offensive. But both Robert and Sol’s perspectives are grounded in their experiences. Sol has a learned aversion toward Jojo that likely comes from all the decades of being in the closet and feeling ashamed of who he is. Robert goes in the other direction; he’s tired of hiding who he is and wants to live loud and proud as a gay man and spend time in the queer spaces that he avoided for so long, like drag queen bingo. Sol and Robert end up in a silly argument about which one of them is the gayer one, which is, of course, absurd. There’s so right way to be gay. But their conversation is pretty realistic. I’d be lying if I said I haven’t had similar joke-arguments with my gay friends. The Robert and Sol subplot leads to a very sweet relationship moment for the two. The story touches on internalized homophobia and on the vastness of queer culture and identity in a way that keeps things light-hearted but ultimately makes it about these characters and their relationship. It could have dug a little deeper and only scratches the surface, but it doesn’t fall completely flat in the same way both their storylines did last episode. There’s still something missing from a lot of the Robert and Sol storylines. Overall, the writers handle Grace and Frankie’s emotional narratives much better and with greater nuance. Fittingly, I’m reviewing this episode on Mother’s Day, and Grace and Mallory’s little subplot about motherhood and grandmotherhood is a pretty significant part of the episode’s emotional framework. Grace takes it very personally when she realizes Mallory told everyone about her pregnancy before her and when Mallory calls in Jean to take care of the kids. But Mallory reminds Grace of a condescending remark she had after Madison was born, when she told Mallory it better be her last kid so that she can start living her life again. Grace doesn’t remember, but Mallory does in vivid detail. It rings as a particularly honest character moment. It definitely sounds like something Grace would have said, and the way Mallory holds onto those words for so long is believable, too. The episode lets both characters untangle their feelings and gives them a bit of resolution without wrapping things up too neatly. Frankie tries to balance her own checkbook, which doubles as a flipbook of two squirrels taking a bow. I love the specifics of Grace and Frankie’s contrasting costuming. In particular, I love Grace’s popped collars and Frankie’s band shirts. Frankie’s potential yam lube name ideas: Vagicadabra, Slip Inside, Lubri-can, Menapplause. Grace throws “Yam, Bam, Thank You Ma’am” into the mix.